In April of 1917, the United States declared war on Germany. Normal peacetime items such as food and clothing were already being produced in this country, only an increased incentive was necessary to meet war time demands. But new factories for modern munitions productions were greatly needed, and four new plants came into existence: Atlantic Loading Co. (AMOTOL), Bethlehem Loading Company, DuPont Engineering Company, and T.A. Gillespie Loading Company. 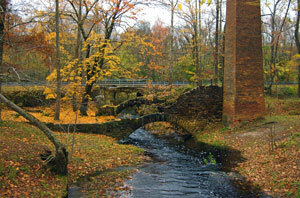 The Estellville Glassworks are located in the Atlantic County Park at Estell Manor. 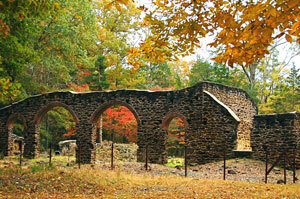 These sites are an early 19th century glass factory that was in operation from 1825-1877. The factory was built between 1825-26 by John H. Scott for the Estell family.The Estell family owned and operated the factory until 1858. The factory had many owners following and finally closed completely in 1877. The Atlantic County Veterans Museum is located in the historic Daniel Estell House, adjacent to the Atlantic County Park at Estell Manor and the Atlantic County Veterans Cemetery. The building is the former home of Rebecca Estell Bourgeois Winston, the first mayor of Estell Manor and the first female mayor in New Jersey. It was built in 1832 by Winston's grandfather and remodeled in the 1920s to Colonial Revival style.